Alex’s debut solo album, “Experiences: Real and Imaginary,” featuring musical luminaries such as Dave Grusin, and engineered by Bill Schnee, will be released worldwide on May 10th, 2019. Alex is now officially endorsed by Kiesel Custom Guitars! Based in Escondido, California, Kiesel has endorsed some of the guitar world’s biggest artists including, Allan Holdsworth, Greg Howe, Frank Gambale, Jason Becker, and many others. Be sure to follow Alex on social media for upcoming content. For more info on Kiesel, please visit kieselguitars.com. In the midst if preparing to release “Experiences: Real and Imaginary” (release date and details coming soon), Alex also has some exciting show dates lined up for the fall. On September 29th at 6pm Alex will perform a short set with Steve Vai as part of the Big Mama Jamathon, a 52 hour, non stop music event beginning on Sept. 28th, that will feature a myriad of world class musicians- all for the benefit of the Extraordinary Families Foundation. Go to www.jamathon.org for more info (flyer above). The following week, on October 4th, Alex will be performing with the legendary drummer Simon Phillips and his band at the Ojai Deer Lodge (Details are attached in the flyer above). Be sure to check out the Calendar page for a more complete listing of Alex’s upcoming show dates. UPCOMING ALBUM - "Experiences: Real and Imaginary"- Alex is working on his first solo record entitled Experiences: Real and Imaginary, and will be recording it in Los Angeles during spring 2018. Greetings, friends and family. I’m very excited to announce the plans to record my first solo record Experiences: Real and Imaginary. As a guitar player, composer and musician in general, this is a very important step for me; A chance to record original music that has been developing in mental and physical realms for quite some time, and to share it with everyone in the best possible form. I’d like to explain the inspiration behind the music, and the amazing cast of friends, mentors and heroes that will be involved. Ever since I was a little kid, powerful music always seemed to elicit the production of poignant images and stories in my head. As I got older I began to question why the phenomena were so closely intertwined. Humans inherit many things both physically and psychologically, and this includes the need to tell stories, as well as relate to our personal experiences in an unconscious, and mythological way. I knew that the manner in which images streamed through my mind could not only be a part of my personal experience; there had to be some unifying mechanism(s) present in others. I believe a big part of the answer lies in what are called archetypes. One of the founders of analytical psychology, Carl Jung, described archetypes as unconscious behavior patterns, or modes of apprehension that we’ve all inherited, which make them selves known through mental images in both waking and dream states. To make a long story short, it is evident that music strongly encourages this archetypal behavior, and that when we listen to powerful music we are tapping into a deep well of charged emotional material. This psychic material relates to our personal experiences, and those of our ancestors. The music that will be on this debut release represents the beginning of hopefully many more installments of “research” into the aforementioned fields. But I need your help to bring it to fruition. I’ve assembled a group of some of the world’s best musicians to be involved with the project, including world renowned film composer and jazz pianist DAVE GRUSIN, Venezuelan born pianist extraordinare Otmaro Ruiz, Benjamin Shepherd (one of jazz's finest young bass players), acclaimed drummer Gene Coye, as well as saxophone virtuosos Danny Janklow and Jacob Scesney. Without your support, none of this will come to pass, and the music will stay unrecorded and unheard. The money you donate will help pay for the musicians, production crew, studio time, and manufacturing costs. I can only hope that the music we end up documenting will have a positive impact on people’s lives, and will allow listeners to become more in touch with the vital, imaginative centers present within all of us. Our experiences are a synthesis of physical, outward events, and the psychic reality that contributes to them. I call the mental realm a "psychic reality" because when a psychological experience is powerful enough, it is real to the one experiencing it; It is as real as the physical event taking place and has a numinous quality. The psychic reality is the real reality, because it is where events (real and imaginary) are experienced. 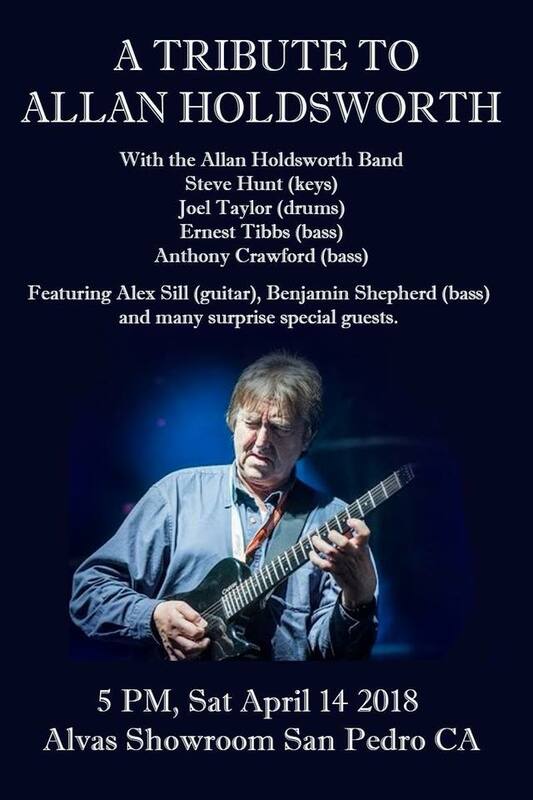 Prior to the public memorial for guitarist Allan Holdsworth in Anaheim on April 15th, 2018, there will be a performance featuring his music and his former band members on the evening of April 14th. Alex will be featured as the lead guitarist, and will be joined by his friend and bassist Ben Shepherd, along with many of Allan's former bandmates including drummer Joel Taylor, keyboardist Steve Hunt, as well as bassists Anthony Crawford and Earnest Tibbs The concert will take place at the Alvas Showroom in San Pedro, CA. On October 26th and 27th (2017), Alex will perform as one of the lead guitarists for the official tribute concerts dedicated to the legendary guitarist and composer Allan Holdsworth. The concerts will be performed at the world famous Baked Potato Jazz Club in Studio City, CA and will feature many of Allan's former bandmates including Virgil Donati, Steve Hunt, Evan Marien, Jimmy Johnson, Anthony Crawford, Joel Taylor, and other special guests. Tickets will be available on the Baked Potato Website. April 13th 2017- Make sure to tune into CMT @10/9 Central for the season finale of Sun Records. Alex will be making an appearance playing guitar as Carl Perkins' brother Jay. Also be sure to tune at 10pm to a live interview hosted by AfterBuzz TV (https://www.youtube.com/user/AfterBuzzTV) featuring actor Dustin Ingram (Carl Perkins), and Alex. Send in your questions, comments, thoughts about Sun Records, or anything else you'd like to ask. March 2017- Alex will be the guitarist in a new Thursday night residency at the Houston Brothers' brand new magic themed Hollywood Club The Black Rabbit Rose. Hosted by Fred Durst, these performances will feature a wide array of jazz music, featuring very special guest performers. Performances will also be interspersed with shows by various magicians. Make sure to arrive early, as the theatre fills up quickly. Details for the first show below. December 2016- In anticipation of the plans to record a full length album of original material entitled Experiences: Real and Imaginary, Alex is releasing some high definition concert footage featuring compositions to be included on the release. Filmed live at the blue whale Jazz club in Los Angeles by the very skilled Alex Chaloff, here's the first in a series of video releases. September 2016- Alex has started teaching in the Jazz Program at Calabasas High School as part of their award winning Music Department. Summer 2016- There's some exciting shows and events booked for the summer months. Check out the Calendar page for more details. Top photo: Taken at Moon People Studios, Northridge. Bottom photo: Composer Oliver Schnee, singer Johnny Hawthorne, Music Producer Joel Sill, Engineer Bill Schnee, Drummer Rob Humphreys, Bassist Andrew Perusi, Keyboardist Alex Burke. and Alex Sill. Taken at Stagg Street Studios, Van Nuys. August 2015- Alex will be returning to the Crown of the Continent Guitar Festival in Bigfork, Montana to perform. Other acts include Lee Ritenour, Dweezil Zappa, Dave Grusin, Jon Herington of Steely Dan, guitar virtuoso Tim Miller, and more. June 2015- Alex has composed the trailer music, as well as arranged and performed the end title music for the August 2015 documentary "Saved In America." (See trailer below). The score for the documentary was composed by one of Alex's mentors- Oscar/Grammy winning artist Dave Grusin.